Medical students at George Washington University met with residents of Washington, D.C., to find out what challenges they face in managing asthma. Medical students cram a lot of basic science and medicine into their first two years of training. But most learn next to nothing about the intricacies of the health care system they will soon enter. That's something the medical school at George Washington University in Washington, D.C., is trying to remedy. "Clinicians today have to graduate being great providers of individual care," says Dr. Lawrence Deyton, the senior associate dean who's spearheading the new curriculum. "But they also have to recognize and be able to act on the fact that their patients, when they leave the clinic or leave the hospital, are going home [and] living in situations where there are all kinds of factors that promote and perpetuate chronic disease." The idea behind the new curriculum is to more closely link medicine with the policy and public health issues that directly affect it. So after learning about the lungs and pulmonary system, for example, the students do a project on controlling childhood asthma. That's what brought the entire first-year class to an auditorium on a rainy Wednesday in May. One by one, small groups of students presented their proposals for how to help control asthma in children in Washington, D.C., especially in some of the city's lower-income areas. "The app gives the mother the chance to be able to really manage the disease," says first-year student Erin Good, describing a concept her group came up with. Called "AsthMama," it's a bracelet that would be worn by a child with asthma that transmits information to an app on a parent's smartphone. How exactly would it work? "Either the child or the bracelet itself can detect problems," Good explains. "Maybe the child pushes it because they feel like they're having an asthma attack." The bracelet would automatically notify a parent or the school nurse, or both, before the problem escalates. Good's group suggested to the panel of experts, including local doctors, parents and city health officials, that the project could be initially paid for by grants, and, if it works, eventually covered by the Medicaid program. It's important to put those policy issues right alongside the clinical medical training, Deyton says, helping students understand everything that influences a patient's health. "So as they're learning about diseases and conditions, they're recognizing those public health and population health and social determinants of health factors," he said. That emphasis on the not-strictly-medical part of medicine appeals to students like Jeffrey Roberson, who was a social worker before coming to GWU. When he talks to friends at other medical schools, says Roberson, "They think it's fascinating ... that we sit and we learn about how our health care system is paid. Other schools don't do that. So you'll have physicians that have no idea how insurance works." 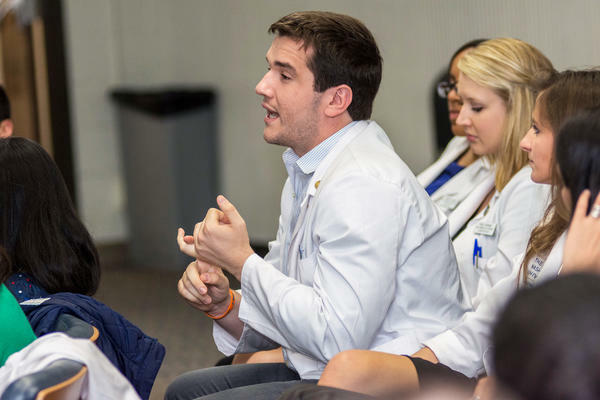 The medical school has some built-in advantages when it comes to teaching policy, among them its location in the heart of the nation's capital. At the end of their first semester, after learning about infectious diseases, the students did a three-day "deep dive" into AIDS and HIV policy. And they presented their proposals directly to the national AIDS czar — at the White House. "It was really just a powerful day to see all of our colleagues, just one semester into medical school, with really innovative ideas, at the White House, and getting feedback from the AIDS czar, from all these major directors of health policy for individual states," Roberson said. Deyton says one of the ideas presented that day — a reminder system to help HIV patients in Tennessee take their medication — might become actual policy. As the students were presenting their proposal, he said, "The director of AIDS for Tennessee was writing all this down." And it turns out she was sitting next to the federal official who would be in charge of getting it covered by Medicaid. "And that person leaned over to her and said, 'You know if you propose that I'll probably approve it,'" Deyton said. Teaching health policy in medical school isn't actually new. Many schools have been doing it for years. But Neel Shah, a physician and policy researcher at Harvard, says what is new is integrating policy and practice. "For example, I remember when I was learning about health care costs for the first time the whole conversation was about the GDP," he said, referring to how much of the nation's gross domestic product goes toward health care. But, said Shah, "nobody goes to medical school to treat the GDP. There's like a huge gap between the macro-level understanding of health care economics and what matters to patients and clinicians at the bedside." It's that gap that today's medical educators are trying to fill. One class at a time. This story was produced as part of a partnership between NPR and Kaiser Health News. Medical students learn a lot about science during medical school, but not so much about other aspects of patient care. But now, George Washington University is trying to improve that link between medicine and health policy and also produce more well-rounded doctors. Julie Rovner has more. JULIE ROVNER, BYLINE: The idea behind the new curriculum is to more closely link medicine and policy. So after learning about the lungs and pulmonary system, for example, the students do a project on controlling childhood asthma. Lawrence Deyton, the associate dean who's running the program, says doctors in the future will need to know much more than just how to diagnose and treat diseases like asthma. They'll also need to be able to understand everything that influences a patient's health. LAWRENCE DEYTON: The medical students should recognize that the child maybe been exposed to smoke in the home environment or toxic fumes or cockroaches that they're allergic to. ROVNER: Deyton says it's important to put those policy issues right alongside the clinical medical training. DEYTON: So as they're learning about diseases and conditions, they're recognizing those public health and population health and social determinants of health factors. ROVNER: That's why, on this rainy Wednesday in May, GW's entire first-year med school class is gathered in an auditorium. One by one, small groups of students are presenting their proposals for how to help control asthma in Washington, D.C. - in particular, how to help control asthma in some of the city's lower-income areas. ERIN GOOD: The app gives the mother the chance to be able to really manage the disease. ROVNER: That's med student Erin Good. She's describing the concept her group came up with, called Asthsmama. It's a bracelet that would be worn by a child with asthma that transmits information to an app on a parent's smart phone. GOOD: The idea being that either the child or the bracelet itself can detect problems, or maybe the child pushes it because they feel that they're having an asthma attack. ROVNER: And the parent or the school nurse or both would automatically be notified. Good's group suggested to the panel of experts that the project could be paid for by grants and, if it works, covered by the Medicaid program. GOOD: We're hoping that it would be an approved medical device. ROVNER: That emphasis on the not-strictly-medical part of medical school appeals to students like Jeffrey Roberson, who was a social worker before coming to GW. He says he often texts with his friends at other medical schools. JEFFREY ROBERSON: They think it's fascinating that we - we sit and we learn about how our healthcare system is paid. Other schools don't do that, so you'll have physicians that have no idea how insurance works. ROVNER: GW has some built-in advantages when it comes to teaching policy, among them its location in downtown Washington. At the end of their first semester, the students did a three-day deep dive into AIDS and HIV policy. And they presented their proposals at the White House. ROBERSON: It was really just a powerful day to see all of our colleagues, just one semester into medical school, with really innovative ideas, at the White House and getting feedback from the AIDS czar, from all these major directors of health policy for individual states. ROVNER: Teaching health policy in medical school isn't exactly new. Many schools have been doing it for years. But Neel Shah, a physician and policy researcher at Harvard, says what is new is integrating policy and practice. NEEL SHAH: For example, I remember, when I was learning about health care costs for the first time, the whole conversation was about the GDP. ROVNER: Meaning how much of the nation's gross domestic product goes towards healthcare. SHAH: And nobody goes to medical school to treat the GDP. There's, like, a huge gap between the macro-level understanding of health care economics and what matters to patients and clinicians at the bedside. ROVNER: And that's what today's medical educators are trying to remedy, one class at a time. I'm Julie Rovner. GREENE: Julie Rovner is with Kaiser Health News. Transcript provided by NPR, Copyright NPR.